Update: congrats to Rebecca R, Theresa J, and Amber H for winning this giveaway. I just can’t get enough of the oversized shirt trend. A couple of weeks ago, I told you guys about how I was tempted by the devil while doing some casual window shopping at Zara. He told me to buy up all of the oversized shirts in the store. Don’t worry, you guys. I stayed strong…and bought only three LOL. Maybe it had to do with it being a cold day when I had my shopping spree, but I couldn’t resist this white eyelet shirt. There’s just something about the color and design that screams sunny perfect weather. It has been a mostly chilly spring, but we finally got a day where it was breezy yet sunny enough to wear the oversized shirt and miniskirt sans jacket. And a good thing too: the cut of most of these oversized shirts are just not made to be layered under jackets. One of my favorite ways to wear oversized shirt is to do the half tuck. 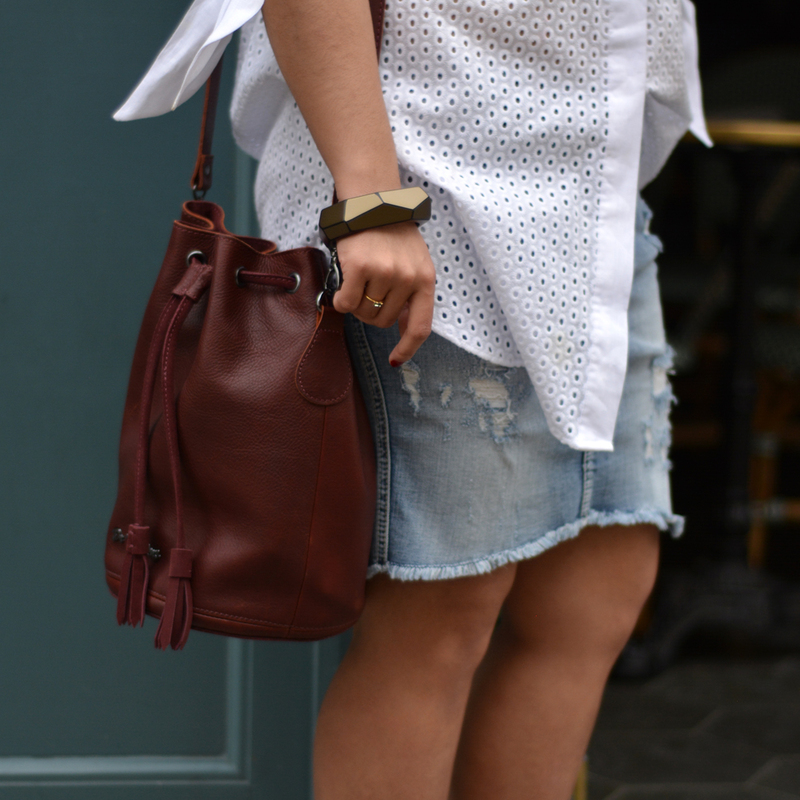 It’s a great way to give the outfit some definition without loosing the oversize-ness of the shirt. I also like the sort-of-messy-yes-I-woke-up-looking-this-fabulous look about the half tuck. My newly acquired bracelet from PONO by Joan Goodman ended up being the perfect accessory to go with this outfit. This bracelet is just the most gorgeous statement piece. It’s been one of my go-to accessories lately. And guess what? I’m partnering with PONO and two fellow bloggers, FASH in NY and Adrianna Naomi, to give three lucky readers a set of these bracelet. Read on to find out how you can win. Outfit Combo: linen tunic shirt from Zara, denim skirt from Silver Jeans, olding classic sunglasses from Persol, jasmine flat sandal from Dr. Martens, bracelet from PONO By Joan Goodman. Sweepstakes begins Tuesday, May 9, 2017, at 12:00 a.m. EST, and closes on Saturday, May 27, 2017, at 12:00 a.m. EST. With a white “boho” style romper, espadrilles and a panama hat. Girl, you’re rocking that front half tuck. Whenever I try to do that, I end up looking sloppy haha, but somehow you manage to make it look as chic as every model I’ve seen slay the trend! It’s so cool how you paired the oversized top with a more structured denim skirt. Loving all this! I agree! I love doing a half-tuck! And oversized shirts are my favorite. Cozy and flattering. 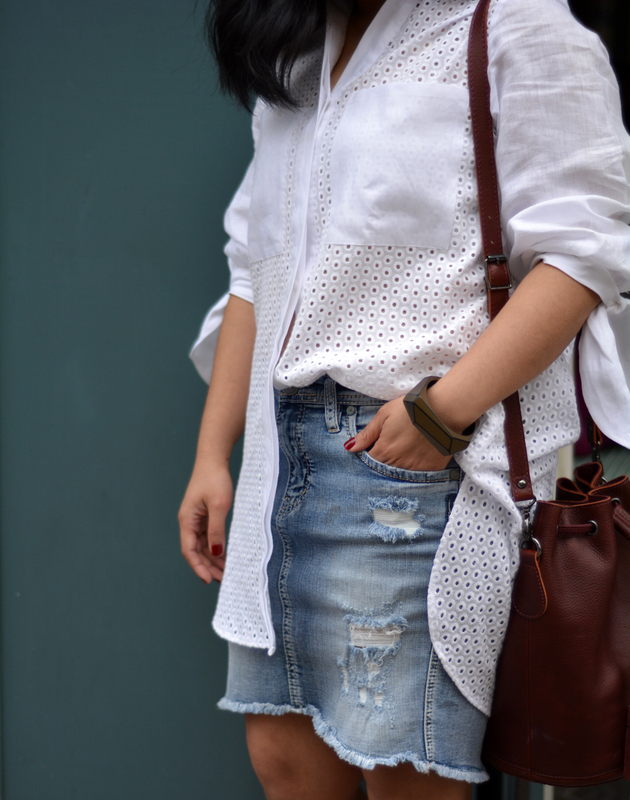 I love how Summer-y this eyelet top looks. Girl it is sooo hard to window shop lol fashion bloggers are awful at that too! 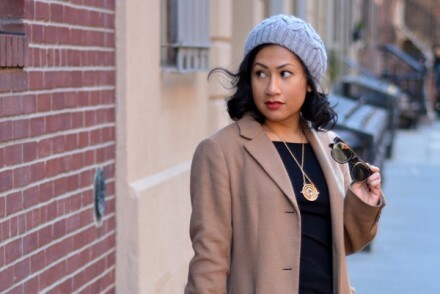 I love the way you styled this outfit! SO CHIC! i love your denim skirt and i do the half tuck trick too! 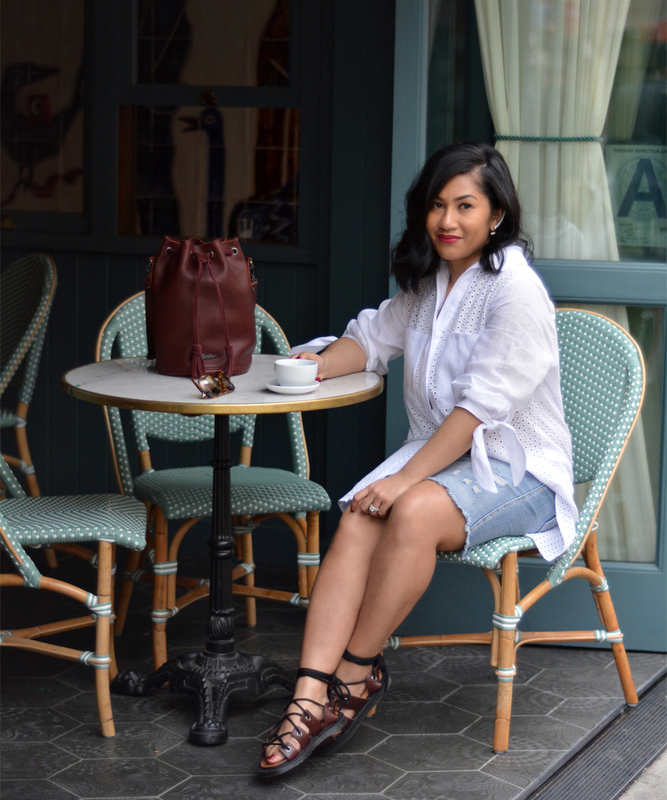 I’m such a half tuck girl, so I’m loving how you styled this eyelet shirt. Such a perfect spring look! Definitely a romper and wedges! With a green fair trade “tuxedo” shirt. With my jeans and a T-shirt. I would style it with my skinny jeans, white fitted tank top, simple necklace, and my curly hair and hoop earrings. These bracelets are lovely! My sister would love this. I am not sure how she would style it. She is great at doing that though. She has a birthday coming up. I think you can wear this bracelet with almost any outfit that you desire. It looks good with a dress or jeans. I would probably wear it with jeans and a white tailored button up shirt with sandals or tennis shoes. I would pair with pumps, darky denim and a white eyelet blouse. I love over sized shirts paired with skinny jeans. I just adore the chunk bracelet your are wearing! I would wear it with a dress. With a cute summer dress and sandals!